At Windcraft we really enjoy looking after our owners – our team that will be supporting you has a range of different skills to support your sailing interests and needs. If you are a keen cruiser – check out Richard below – he has cruised with his family for 5 years. A racer – talk to Ric. Interested in the latest electronics – talk to Hayden – he is the whiz electrician in the team. Our yachts are known for quality of build – Dave Griffin our shipwright will give you the nuts and bolts on why. Starting out in the IT industry, progressing to helping start-ups get up and running and tackle new markets, Anthony brings extensive Sales and Marketing experience and expertise to the Windcraft team. A Kiwi who grew up in Christchurch and then Wellington, Anthony first sailed in an Optimist built by his grandfather. His passion for boats, sailing and the brand were already a natural fit, and his approach to the business is as much that of a boat owner and enthusiast, as it is as Managing Director. Anthony also loves to fly aeroplanes and ride motorbikes. An engineering draftsman for 10 years – Allan worked in the UK and Singapore. He is also a commercial skipper and co- owned the successful Pittwater Yacht Charter business before joining Windcraft in 2006. Allan’s keen attention to detail comes in part from his engineering- gravitating towards jobs requiring process and specifics; and applying those principles to ensure a certain result. Allan’s first role at Windcraft was to establish the unique service centre. Since then Allan has overseen the growth and development across every area of Windcraft. Mary’s passion for sailing began with windsurfing on the south coast of England and Portugal while at university. In Australia came boats – first a Hartley TS 16 and later a Northshore 370. A six -month cruise up the east coast of Australia with her family before starting at Windcraft was the achievement of a long held dream and has proved invaluable in helping prospective Hanse owners realise their own dreams. Mary’s background is in sales and brand establishment. She loves starting from scratch with a great product and is very proud of how firmly established the Hanse brand has become in Australia. Mary works closely with customers to find out what type of yacht and options will suit them best and has played a key role in creating the Windcraft community. Mary is learning Portuguese and loves cycle touring – especially with her two daughters. Ric has been sailing since he was 8 and skippered his first yacht as a professional when he was just 15.His passion is performance sailing and he has been involved in a number of regattas in Australia and also overseas including the U S, France, Italy, Hong Kong, Switzerland, Denmark and England. Along with racing, Ric spent 10 years as a yacht broker. 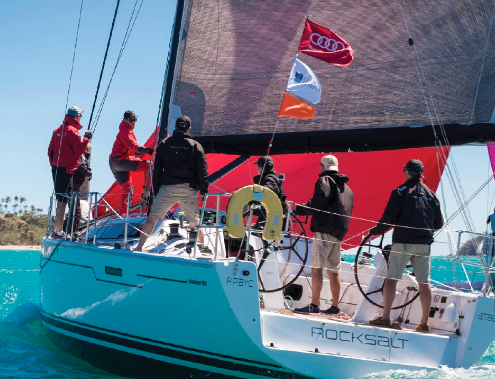 Whether it’s helping beginners with parking their new yacht in a marina berth, encouraging clients to give racing a go, or giving experienced sailors “hands on” help fine-tuning their racing technique, Team Windcraft’s Ric Hawkins loves sharing his passion for sailing. When Ric is not out sailing – which is rare – his current favourite pastime is being at home with his little daughter. Because of her Ric hasn’t been doing much of his other hobby – ski ing. Robert has been a keen sailor since sailing Manly Juniors out of Balmoral as a child. He is an avid twilight sailor on Pittwater with Woody Point on his Etchell being his favourite. Robert ensures the Service Centre runs smoothly and efficiently and is proud of the complete after-sales service we offer our customers. The one-stop service centre is staffed with a highly skilled team of marine specialists. Roberts outstanding management skills, love of boating and technical skill combine to ensure that customers and their boats are looked after to a high standard. Robert has extensive experience in staff management, recruitment, training, sales and customer relations gained in many industries. Robert loves music – especially live in quirky small venues. A great traveller Robert is as happy exploring Sydney as he is countries across the globe. Inheriting his love of boats and yachting from his father – Ross developed this passion on lasers at school and while yacht racing out of Cowes and Plymouth. After a degree in Biology, Psychology and Marketing Ross was an account handler in London’s advertising industry. But the call of the sea led him to complete his Yachtmaster Offshore qualifications and move to Australia where he joined Windcraft in 2011. Ross project manages the commissioning of each new boat – liaising with owners up to and following the boat’s arrival in Australia. Ross works with our network of expert contractors to ensure that when Windcraft hand over a new yacht to our clients, we are confident it is exactly what they want and to the high standard expected. Ross sails at every opportunity and loves being part of the Soling fleet with his work colleagues. Ross is a keen if somewhat accident prone snowboarder and has a very large dog. He has been working in the marine industry for 20 years, specialising in technical logistics in the Aftersales area but also in finance. Robert has recently joined Windcraft with a goal to improve the financial operation of the Service Centre. What you probably don’t know about Robert : He loves travelling and is a keen triathlete with a particular passion for cycling. Robert and his wife have just had their first baby! Richard,his wife and daughter spent 5 years living and cruising on their Hallberg Rassy. Their adventure took them from the icebergs of Alaska at 59 deg North to to the tropical waters of Australia. Richard is an entrepreneur with a background in IT. He has owned many businesses and lived all over the world. Because of this he understands the importance of customer needs and excells at customer service. Richard may sound very English but he has worked as a Jackaroo on a remote outback cattle station and loved it! Tom has been a sailor as long as he can remember. An instructor in both the UK and Sardinia picking up many qualifications along the way including Yachtmaster Ocean. Tom enjoyed a few years working as a crew trainer with the Clipper Round the Yacht Race. He has also spent a few years skippering private yachts in Europe. Tom’s career path led him to project management of Yacht refits at Berthon International in the UK. On moving to Australia he worked at Noakes Boatyard in Sydney before joining the team at Windcraft. What you may not know about Tom – he is a keen road cyclist and that is one of the reasons he is loving his move to Australia – more sunshine more cycling. Tom is also a keen cook. A northern beaches local, Hayen has always loved boating.From a first job as a marina attendent at the Royal Motor Yacht Club to a six month stint working on superyachts in Florida – being a marine electrician allows him to combine his passion and work. Hayden already had 5 years in the industry before joining Windcraft where his skills are in high demand to keep up with the changing technology. Hayden attends regular manufacturer dealer meetings to keep up with new products and approaches. Hayden works with both the commissioning of new boats and looking after existing customer needs. Troy has grown up around the water and is completely at ease behind any marine wheel. He spent many years delivering big Sunseeker and Princess motor yachts to Hamilton Island. Troy is completing the final stages of his apprenticeship while working alongside Hayden at Windcraft. Almost every weekend Troy will be off camping somewhere in NSW . His favourite destination is the Myall Lakes where he likes to fish as well. From the chilly Scottish lochs of Scotland to the Med and the Caribbean – Iain has been sailing and teaching sailing from a young age. A keen racer, a highlight was being part of the winning team at Cowes Week Regatta in the Etchells class. Iain’s career has focused on boats, including being a deckhand and head of water sports on a 65m Superyacht based in Monaco. With Windcraft since 2012 his attention to detail, customer communication skills and depth of knowledge about our boats is invaluable. Dave Griffin is a renowned third generation shipwright and qualified marine surveyor. Boats and boat building are in Dave’s blood. Since an apprenticeship with his father and grandfather Dave has travelled all over the globe building racing, cruising and timber boats. Now he is enjoying being back home on Pittwater and working with the Windcraft brands. Windcraft are privileged to have a shipwright of Dave’s calibre on the team to commission and look after owners boats. When Dave isn’t working he loves above anything else to spend time with his family. Sue joined Windcraft in 2014 and after an urban up bringing , feels lucky to have the opportunity to work in such a beautiful location. Sue loves to twilight either on a Soling on a Wednesday or with the Ladies RPAYC. A qualified management accountant, Sue has 20 years experience in accountancy roles in various industries in the UK and Australia. Sue’s focus is to provide the accurate/meaningful data to enable smooth running and planning for the future. She is motivated by the challenge to improve processes and systems. Sue is a keen ballroom dancer, loves a bit of Latin American dancing and well, any dancing really! Happy when busy Sue is training as a Celebrant. Lisa works at Windcraft two days a week in Accounts Support, processing and reconciling invoices. She enjoys the systematic and satisfying nature of her work. Lisa has a varied career background from working in the airline industry and customer service, to roles in office management. Working part time gives Lisa an enviable work life balance, sharing her time between Windcraft and her family. Lisa joined Team Windcraft in late 2015 and very quickly began enjoying working with “great people” and understandably loves the beautiful surrounds of the Bayview office. She says she is proud to work for a company with a “reputation for professionalism, honesty and efficiency”. Lisa has recently got the golfing bug in a big way and is already a keen competitor. Tracey has recently joined Windcraft with many years of experience as a front desk receptionist. She is talented at being on the front line and has developed excellent customers service skills in a variety of different companies. Much of her patience and communication skills have come from her years as receptionist in aged care facilities. Tracey is keen cook and loves trying new recipes out on family and friends. She also likes to keep up with the restaurant scene. Born to a family of boating enthusiasts, Dom has been sailing since the age of 5 and owned his first boat at 21. His initial career was in Sales and it was a natural path to the marine industry as a broker.This was followed by a few years as an offshore navigator on a seismic research vessel. Dom found his dream job when he joined Windcraft as Manager of the New Zealand branch in 2013. Dom is a keen competitive stand up paddleboarder and is also a boxer. He loves spending time at home with his wife and young daughter. Carole has enjoyed yachting for 25 years – around the Hauraki Gulf and Bay of Islands- on board their 42 “ Lidguard Regardless called “Repose”.Carole learned to sail at the Penny Whiting School ,is a long term member of the RNZYS and completed her boatmasters and Coastal Yacht Masters. A highly skilled Office Manager with over 20 years experience in accounting, administration, human resources and client relations in a variety of industries including IT and the wine industry. Vagn’s whole life has been sailing and boats! Most recently he spent seven years on superyachts all over the world – four of which as skipper. The arrival of their first daugher brought Vagn and his wife back to New Zealand for a land based yachting job with Windcraft. As Captain of privately owned superyachts Vagn knows about managing and meeting high level expecations with excellent service. He enjoyed meeting that challenge and creating lasting relationships with the owners. This skill is ideal in his role as Service Manager at Windcraft and a role he relishes. Vahn is a passionate enviromentalist and has a degree in Marine Enviroment Science. His 1.2 acre section is protected nature bush! Patrick grew up on the East Coast of Canada with the beach and boats part of family life. Working in the marine industry, Patricks focus has always been operations including hauling and rigging . On Marina’s in Canada and with Pier 21 in Auckland before joining Windcraft as Service Support. His talent for problem solving, communication and team work lend themselves to this role. Patrick is passionate about fitness and a healthy lifestyle. He played competition football in Canada and is currently training to run his first marathon. His apprenticeship was in Germany and it was on a sailing trip to Greifswald that he first became aware of Hanse – the name on so many boats in the harbours. Andre was onboard the famous Grief Finash schooner sailing from Greifswald to Sweden. The quality and reputation sparked a desire to work with Hanse which he has fulfilled since moving to New Zealand. Andre’s career in the marine industry started with boatbuilding – working with glassfibre, timber and gelcoating. Andre is into wakeboarding and most watersports. He is also a keen volleyball player. Nick started sailing as a teenager, racing with his dad and progressing from pulling spare ropes on a Cavalier 350 SL to doing a couple of seasons on the foredeck of a Northshore 369. These days he is often racing in Port Philip Bay, offshore or at Hamilton Island. “…Firstly… if you can see a way to do something better… then do it better. And secondly… there are no problems… only solutions”. A Melbourne local Jade Cole heads up Windcraft sales from the office at the Royal Brighton Yacht Club. A notable sailor and advocate of women in sailing – Jade is aiming to become the first Victorian woman to compete in 10 Sydney to Hobarts – watch the space on the CYCA Honour board! With 7 already notched up Jade is well on her way. Jade’s experience in the marine industry, local knowledge and personable nature mean a great fit to the Windcraft team. With sales experience in the marine industry, Jade was attracted to the unique approach that Windcraft takes along the customer journey and is proud to join at this significant stage in its development. A passion for yacht racing with a team and love of cruising with her family enables Jade to connect well with customers across the sailing spectrum. When not on the water or in the office – Jade loves to shop, and shop – particularly for shoes!